Nokia has launched a series of keyboard-enabled phones that have the "look and feel" of the popular BlackBerry devices. The Nokia E60, Nokia E61, and Nokia E70 are Nokia's first keyboard phones that have obviously borrowed a page from Research In Motion's Blackberry devices by offering a thumb keyboard. The Nokia E61 is due out in the first quarter of 2006 and is the first phone based on Symbian, that features a thumb keyboard. The eSeries devices also include the push-to-talk walkie-talkie feature, Wi-Fi, Bluetooth, and infrared wireless connectivity, as well as USB 2.0. The phones feature color screens for viewing emails, plus attachments viewing and editing. The phones are expected to be priced between $420 and $540. Nokia will offer two versions of the Nokia E70 - one optimized for mobile networks in Europe and Asia and one optimized for mobile networks in the Americas. However, both versions can roam in GSM networks in any region. MobileBurn is reporting that the Nokia E60 has a SIP softphone client on it. I'd be surprised if the E61 and E70 didn't have the SIP client as well, but MobileBurn doesn't mention these two Nokia models. 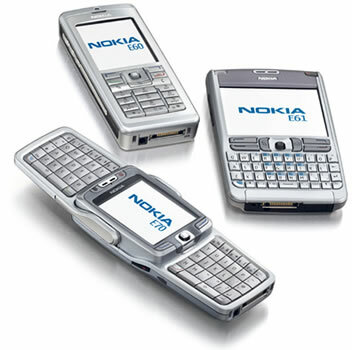 The Nokia E61 is due out in the first quarter of 2006 and is the first phone based on Symbian, that features a thumb keyboard. The eSeries devices also include the push-to-talk walkie-talkie feature, Wi-Fi, Bluetooth, and infrared wireless connectivity, as well as USB 2.0. The phones feature color screens for viewing emails, plus attachments viewing and editing. The phones are expected to be priced between \$420 and \$540. Nokia will offer two versions of the Nokia E70 - one optimized for mobile networks in Europe and Asia and one optimized for mobile networks in the Americas. However, both versions can roam in GSM networks in any region.